But try it, can you answer that question? I mean aside from the obvious, vague answers like health, win the lottery, love etc. What do you really want? Be really specific. Some say that this is a negative approach but I don’t agree. It’s like clearing away the weeds, it helps you dig down to get a bit clearer. Seeing what you don’t want makes room to see what you do want. If you don’t know what you want, how can you change anything? Be wary and don't get sidetracked by asking too many questions. Try to stay focused on the main question: "What do I really want?" A key aspect to this question asking is to imagine how you feel about the answers you are giving. You really get the insight when you pay attention to the feeling. Does your voice rise a little and do you feel your pulse and energy quicken when you talk about it or visualize yourself doing it? These are sure signs that you are in alignment with a true passion. Be careful when you are asking these questions and thinking about what you want. Don’t let any limiting thoughts creep in such as “I don’t know anything about that” or “I wouldn't know where to start”. If you watch your self talk you may notice how these little critical questions slip in…. Trust me, when the time comes to start the new action the way forward will show itself. Just get the “what”, don’t worry about the how, when or where right now, the information will show up at the appropriate time. Just tell yourself that you’re not going to worry about that right now, all is well. So be totally open with yourself and visualize what you really want. As you go through these exercises you will get clearer and clearer. And as you do, you will start moving toward the new you. 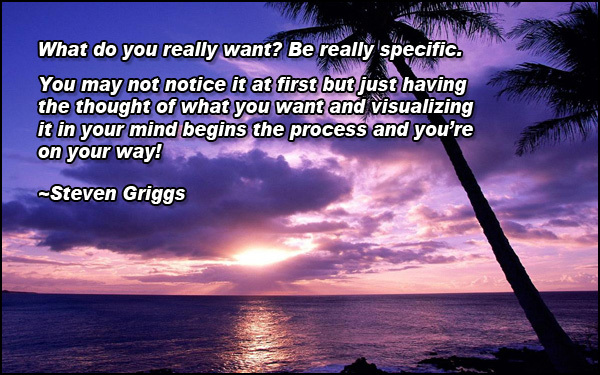 You may not notice it at first but just having the thought of what you want and visualizing it in your mind begins the process and you’re on your way! Labels: getting clear, No Limits, Passion, what do you really want?